It is beautiful, but excuse me if I skip swimming! I'll have to find this one. 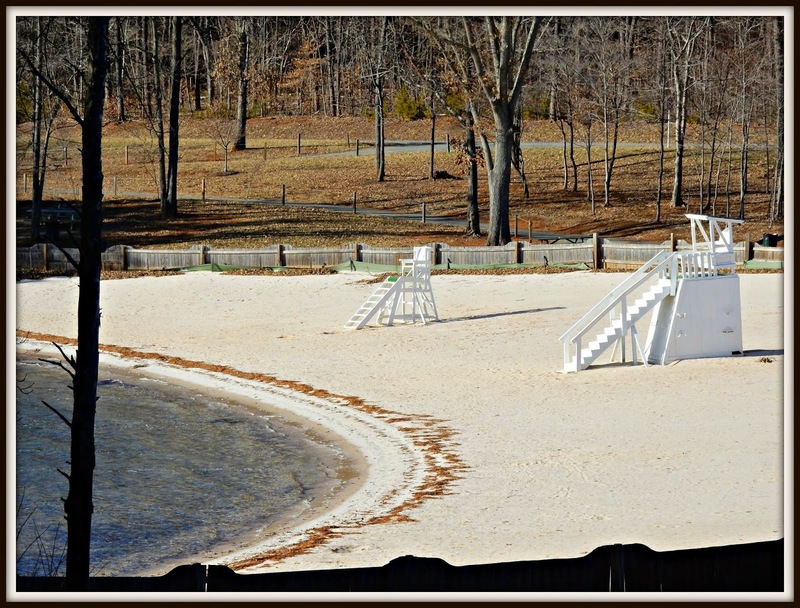 I sometimes stop off and run Claytor lake's beach in the winter. The sand is kinda brown so SML looks very nice. I still sit in the sun, you have the whole place to yourself. That's a pretty nice beach area. Oh I do too! This is a lovely spot. I also wanted to comment on how cool it was to see snow on the beach area and the woods without it! very cool. That looks like a nice area. Is it in the Franklin County area of the lake? Looks like a pretty spot, I would enjoy it more on a warmer day.. Great fence photo. Have a happy day! I have so many friends who go to Smith Mountain Lake, they say there are other entertainment things there, too. Do you go often? Is it really that awesome? I love winter beaches too. I look at Tybee Island on the web cam just about every morning, so I can watch the dawn come up there with my coffee. When we are down there, I get up early, get a cup of coffee, and I'm out on the beach just as the sun starts to rise. This makes me want to take a road trip to Lake Michigan over my weekend. Looks like you have the whole beach to yourself. Been so cold here I haven't even thought of a beach. looks like a nice serene spot to spend a few minutes. Well, it certainly looks quiet! It does look like a restful place. I bet it's a lot more quiet this time of year. Pretty picture! Looks like a great place to get out and walk. A peaceful place this time of year. Beautiful. But too bad it isn't warmer!